The fotoLibra site was down from about noon on Sunday 17th January to this morning, Monday 18th. Apologies for that. The problem was down to domain name system renewal propagation, which has now been sorted out. When we started fotoLibra back in 2004 we got the fotoLibra.com website, and we had to pay some company in America to point people towards it — to make sure that an IP address, a series of numbers, in our case 77.240.1.218, would resolve into fotoLibra.com. We paid them for two years. Hey — we didn’t know if we’d still be around in 6 weeks, let alone two years. Two years later we were pretty confident. Things were going well. So we renewed the DNS service for another ten years. Yesterday, when we logged on to fotoLibra and saw a holding page offering the domain name fotoLibra.com for sale, our first reaction was outrage. The second was self-blame. We contacted Network Solutions to demand to know why we hadn’t been told. They assured us they had sent renewal notices on November 30th, December 11th, December 28th and January 11th. They were not able to reveal the email address to which the renewal notices had been sent. I see all correspondence through the email box we registered with Network Solutions, and I saw nothing. Of course, it could have landed in Junk. I get about 600 junk emails every day and before deleting them I speed scan the senders to ensure I haven’t missed anything I recognise. Which reminds me — if you contact fotoLibra and you haven’t had a reply within 24 hours (longer at weekends) please send your email again, because it may have fallen into the Junk folder. It was then we discovered that our broadband service was also down. I couldn’t get on line, I couldn’t see the site. I rang our ISP, the wonderful Zen Internet, to hear a recorded message to say the Crouch End district was suffering an outage. Outage? Outrage! So the elderly 3G phone was pressed into service, and I finally, after long delays and several hours picking through a tiny keyboard, managed to renew our domain name system. User names, contact details and passwords all seem to have changed over the years, but we managed. Then comes something called DNS Propagation. It takes time to circulate info across the world wide web, and as I write the fotoLibra site is up and running on my computer here in London, on Network Solutions’ computers in the States, but not on Yvonne’s computer across the room from me. It will all have resolved itself by 9pm GMT at the very latest. I’m very sorry about this. It’s not my fault but I feel I’m to blame. To stop this happening a second time, please could you all make a note in your diaries to email me in December 2025 to remind me to renew our DNS through Network Solutions? I was sent this wonderful image. I don’t know who sent it; the email address it purported to come from bounced back. Through the magic of TinEye and PicScout I can probably track down the source, once I post it online. But it’s not mine to post. Whoever took the photograph should be proud. He or she has a good eye. 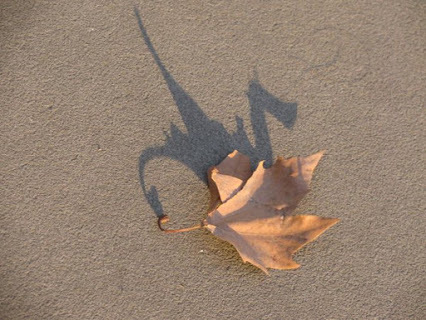 I see a Welsh dragon in the shadow, which is why I’ve titled this ‘A Welsh Leaf’. (Everything looks like a nail to a hammer.) And the proud photographer probably added all sorts of information in the metadata, some automatically input by her DSLR or smartphone camera, some which she might have added to describe the image, caption it, keyword it, to help people to find it, buy it, share it, credit it. But apart from its incomprehensible auto-created filename — 208655-1000-14471607882761860-R3L8T8D-1000-gjVfnT8.jpg — all the metadata you’d expect to be associated with this image has been stripped away. I don’t know who took this photograph, where, or when. Well we can discard #1 immediately, as acquiring your personal details is the whole purpose of a social network site — although it might have a scintilla of truth in that they’d be very reluctant to share anything with another social network, and if they left the EXIF and metadata intact then everyone could see it. #2 makes a tiny bit of sense. Metadata can scarcely take up more than 1% of an image’s filesize, but these guys make their profits through nanopercentages. With 400 million images uploaded daily to Facebook, each say 50Kb, that’s 400 gigabytes they could save each day. #3 Locking people in? They’ve got you by the short ‘n’ curlies already, but they might want to try and cement the relationship. Which brings us to #4. What does this actually mean? It means they can do whatever they want with your images, and they can sell that right on to whomsoever they please. Money. Power. It doesn’t matter that the image is lo-res at 72 ppi; they’re only interested in digital usages. If you upload Jane Jones’s image under a Creative Commons licence to your Facebook page, and supply the appropriate credit, you are doing no wrong. But Facebook will strip the metadata and under the T&Cs you agreed to, you have granted them a non-exclusive, transferable, sub-licensable, royalty-free, worldwide license to use any intellectual property content that you post. So who does Jane Jones sue? Certainly not Facebook. Even the government daren’t sue Facebook. They ignore copyright laws with impunity. They ignore tax laws with impunity. Corporations such as this are striving to become supranational, to become greater than the law, more powerful than independent states. And stripping the metadata is the broken pane of glass that allows them to get away with it. They’re taking the locks off your doors. It shouldn’t be allowed. It shouldn’t be possible.